I want to thank everyone for your kind comments on my last BLOG dated February 20th .. It took me a few days to read all of yours and what a joy it was seeing everyone’s progress. On March 20th I’m really looking forward for our final reveals. I am making a few changes to my Design Line “Adventures In The Sea” .. If you remember I named each piece of jewelry .. the changes I am making are .. each piece will not have its own name .. they will be named by series ..
Sinann .. Will be necklaces made using the smaller Mermaid with other similar components .. I have several more jewelry pieces completed and I’m excited to show y’all on March 20th ..
Ok everyone my comment section is up and running and is located at the bottom .. YAH .. Thank you Marcia for helping .. it worked!! What an adventure the last 28 days have been. My design line is really coming along great and I’m very happy with my progress. I plan on having 8 levels in my pyramid with prices ranging in Level 1 thru 4 from $15.00 to $50.00. Level 5 thru 8 are priced higher and are limited editions. When starting the process of writing my blog and adding pictures something was missing. Fireworks started going off in my head and I had one of my aha moments … I need names for my jewelry pieces. So let me introduce you to a few pieces in my new jewelry line .. Adventure In The Sea Earrings .. are made with shells, B’sue components and of course pearls ..
Adventurous Mermaid .. 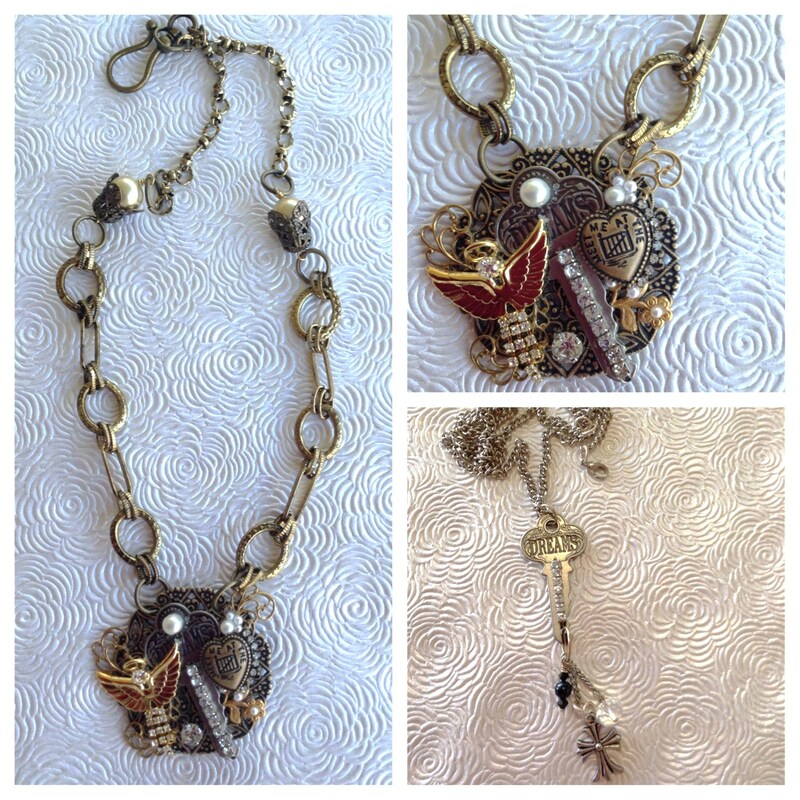 I did run into an issue with my reversible mermaid necklaces shown below. Originally I wanted to use mother of pearl as my center piece but they were all to thick. The front and back of my B’sue components would not seal tight. After many hours of brainstorming and walking the hobby store isles I found a solution for my reversible Adventurous Mermaid Necklace .. Burlap .. what do you think ? Doesn’t every lady want to fill like a Goddess sometime in their life? Sedna has a rhinestone waistband and hangs from a beautiful B’sue connector. Both of these pieces are painted using alcohol inks. 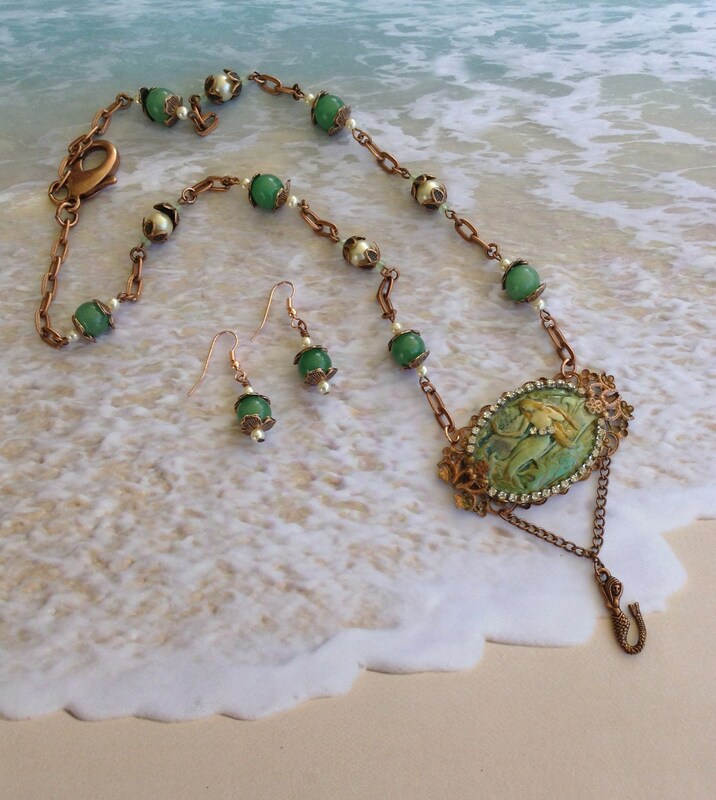 Brass chain, jade beads and vintage pearls are used in the chain. Sinann has copper wire wrapped around her tail with pearls and crystals and she hangs from a beautiful B’sue connector. 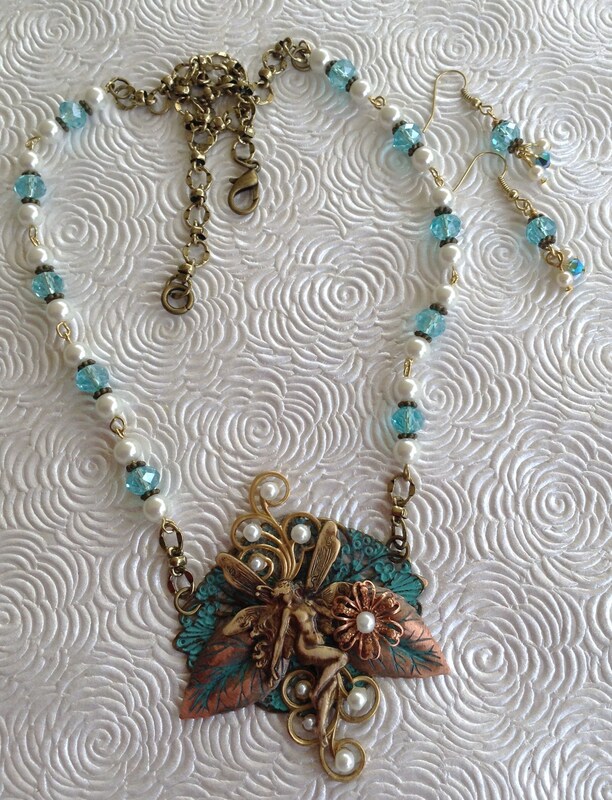 Copper chain, pearls and crystals are used in the chain. Susanoo has a rhinestone waistband and hangs from a beautiful B’sue connector. I used Rusty Black components in this piece and slightly buffed them back so that a small amount of copper shows. Seri .. B’sue rhinestone seahorse is just so pretty .. Seri dangles from a beautiful B’sue connector and I used B’sue vintage pearl chain ..
Level 4 .. Sabrina .. I love B’sue mermaid / seahorse heart component .. I used 3 different swellegant patina’s to get my desired color. Sabrina is ready to ride a wave ..
Seashore cuff bracelet’s are sold as a limited edition. Each one of these bracelets are wrapped with either silk or lace. Each component is wearing rhinestones and is tangled in tea tied lace. 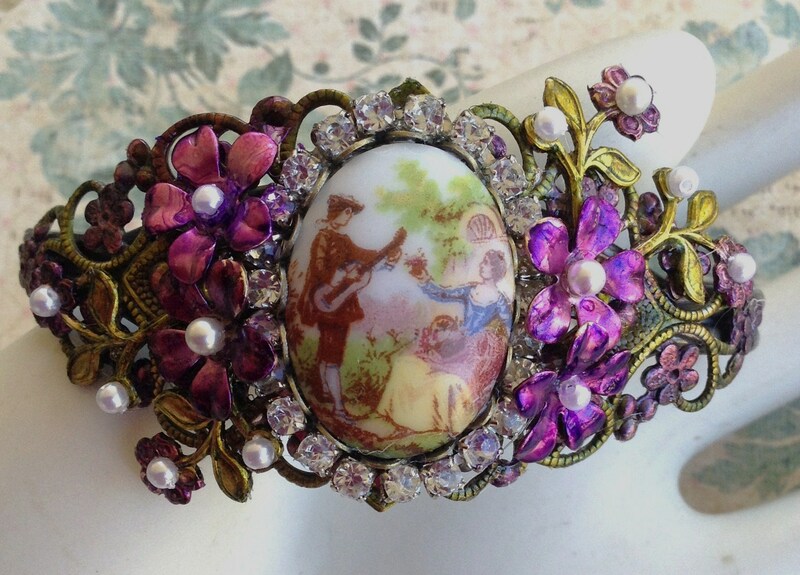 Flat back pearls and other charms are on all cuffs. My process for designing is normally done in my head and it makes me a little crazy sometimes. Going thru this procedure I have learned to prepare, take control and to stop over thinking my designing. I am a huge visual, I now have a dedicated area for my components and beads for the projects I am working on. 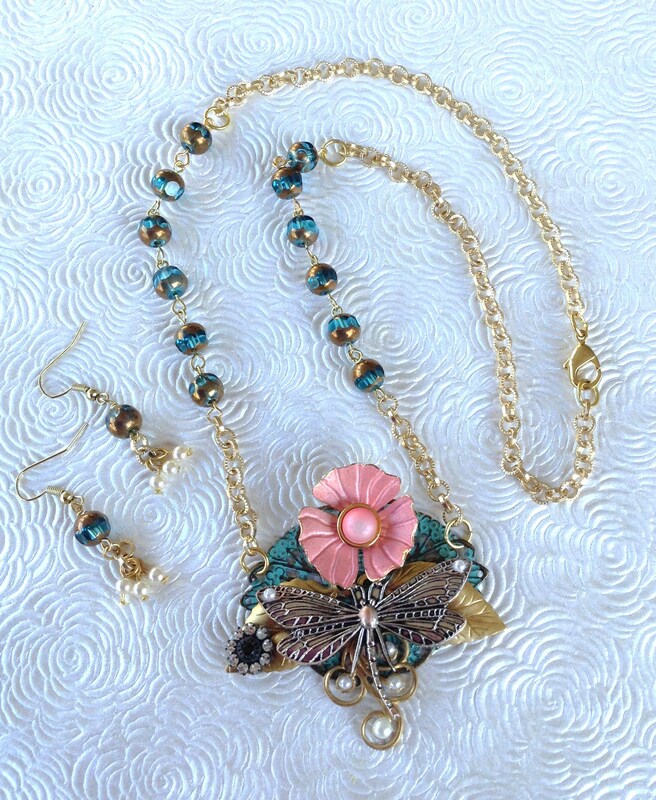 The B’sue Boutiques Build A Line Challenge (BALC) is being taught by our mentor Brenda Sue Lansdowne and is sponsored by B’Sue Boutiques .. What a fun Group ..
Did you watch Brenda’s video “Jewelry Design One of a Kind Pieces Versus a Cohesive Jewelry Line from B’sue”? Wow what an eye opener and it really got my juices flowing .. If you haven’t watched this video you should take the time ..
Thank’s for reading my Blog and I hope you enjoyed my 28 days of makering. Listed below are the amazing designer’s who are participating, please check out what they have been up to. Mark your calendar for March 20th which is the final chapter of BALC Blog Hop ..
Problem’s With Commenting On My Blog ?? B’sue Boutiques Design Team Challenge first Blog Hop was held on January 23rd and was very successful. Thank you everyone for your sweet comments on my new design line “Adventures In The Sea” . Several people advised me that they were having a issue finding the comment section on my blog .. all you need to do is click on the title above and it will open my blog , go to the bottom and you will find the comment section ..
My Adventure In The Sea line is coming along .. I have 3 pieces completed and several works in progress .. here is a sneak peak ..
I’m Jann Tague of Clever Designs and today is January 23, 2015. It’s the big reveal day for our first Build A Line Challenge from B’sue Boutiques http://www.bsueboutiques. This is part one of a series of three Blog Hops. I hope you will follow my journey for the next three months. We have 56 members who are participating and through this journey we are going to learn how to design a jewelry line taught by Brenda Sue Lansdowne. In 2006 I reconnected with a high school friend and she introduced me to Bead Embroidery. I was hooked right away I searched around for different supply stores in my area and a new beading store opened near my home, wow what a treat. I started taking classes to learn different techniques and that’s when I was introduced to mixed media and to the B’sue Group. 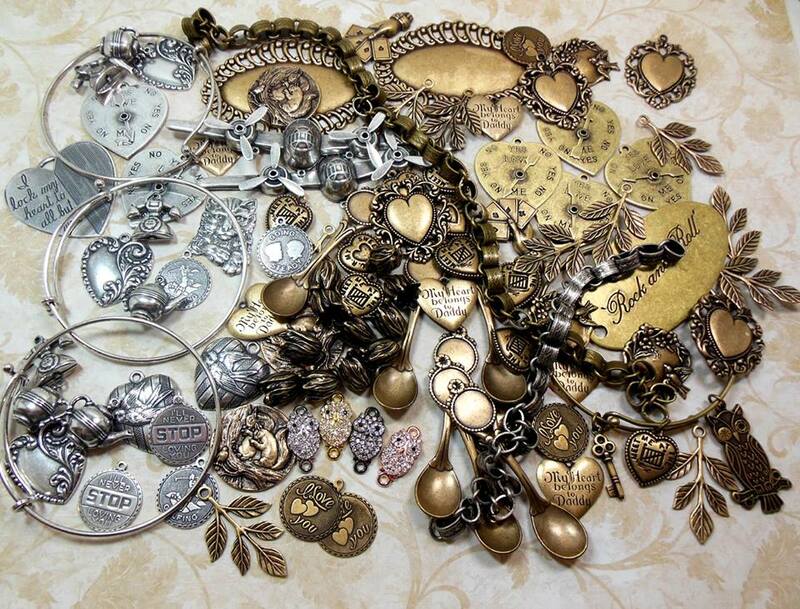 As time went by family and friends were asking if they could purchase my jewelry. This is when I decided to start my business Clever Designs. 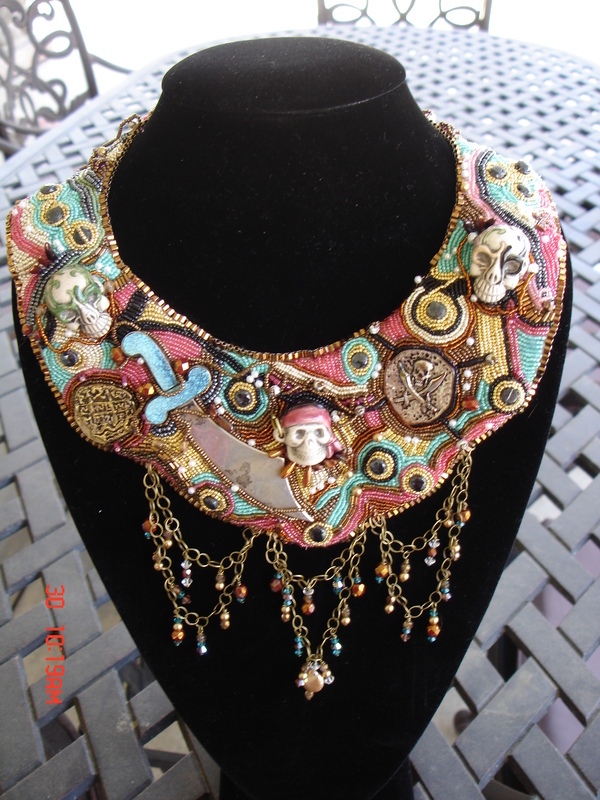 Here are a few Beaded Necklaces I made a couple of years ago ..
What we have all been excited about .. revealing our design line .. My line is called “ADVENTURES IN THE SEA” .. Why did I select this design? I grew up in Southern California and was always at the beach. I love the smell of the ocean breeze and feeling the sand between my toes. Already knowing B’sue Boutiques has amazing ocean components, it wasn’t hard for me to make my decision on which components I wanted to use. I will be using Mermaids, Seahorses, Starfish, Octopus, Pirate Ship / Masthead Maiden and maybe the Mermaid and Anchor Cameo’s. In the majority of my design pieces I will be using Aqua Copper with Verdigris Stampings; However, I didn’t want to limit myself to one color so I also plan on using Raw Brass, Brass Ox and Rusty Black stampings. The color palate I have chosen is, Blue, Green, White, Sand and Coral. A few of my Adventures In The Sea Components awaiting production (of course other beads, chain etc. will be added to my work in progress). I am hoping to do one bead embroidery signature piece at the end of the challenge. Are you ready to dive in .. I hope you enjoyed my blog and you will follow my adventures with me .. Be on the look out for two upcoming Blog Hops on February 20th and March 20th ..
May your life be filled with relaxing sunsets and sand between your toes .. Thank you for visiting my Blog .. The list below are all participants, be sure to visit their Blogs and you can start following them also. On Your Mark .. Get Set .. Go! I am so excited .. I have been accepted into the BUILD A LINE CHALLENGE sponsored by Brenda Sue Lansdowne of http://www.bsueboutiques. Sixty spots were available and 59 members will be participating. I cannot show you my design line until January 23. Also on this same day we are having our first Blog Hop and we will reveal our new design line at that time. This is the first time I have participated in a Blog Hop, I’m looking forward to it, but somewhat nervous. I will be plenty busy for the next 3 months working on my designs. NEW YEAR NEW LOOK .. This is January & February’s Challenge at B’sue Boutiques .. We are challenged to find a piece of jewelry that we have and to redesign it. I finished up on my piece yesterday. Bottom right corner is my before and the other pictures are my after. 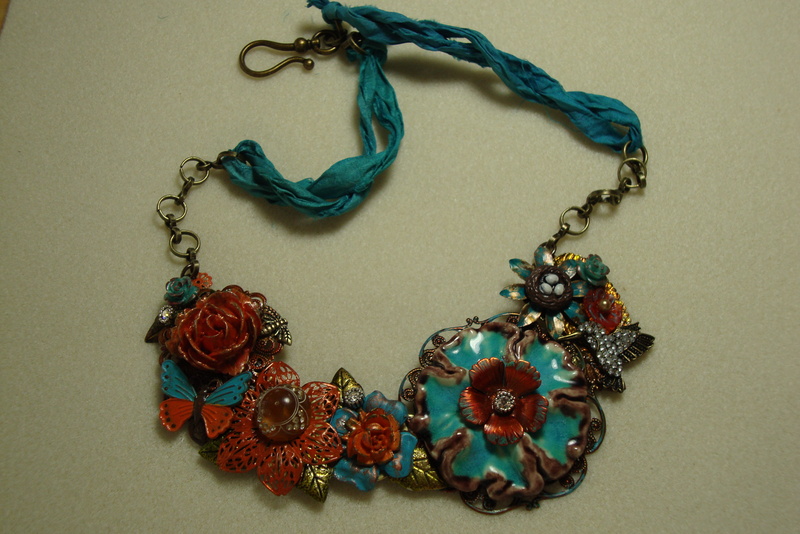 Yesterday was Finish Up Friday (FUF) I mastered to get both of the Collage Necklace’s done. Which one do you like? Living in Southern California I spent many day’s at the beach, which inspires me to design some of my jewelry .. This is a piece I designed in 2014 ..
Hope to see y’all soon ! What a year 2014 was .. One of the most exciting things for my family was my Grandson Jake, who is now 8, underwent two facial surgeries. He was born with a medical condition called Moebius Syndrome, which is a rare neurological disorder that is present at birth. See more at: http://www.moebiussyndrome.com. Both surgeries were successful and we thank God for watching over Jake and his wonderful doctor’s. 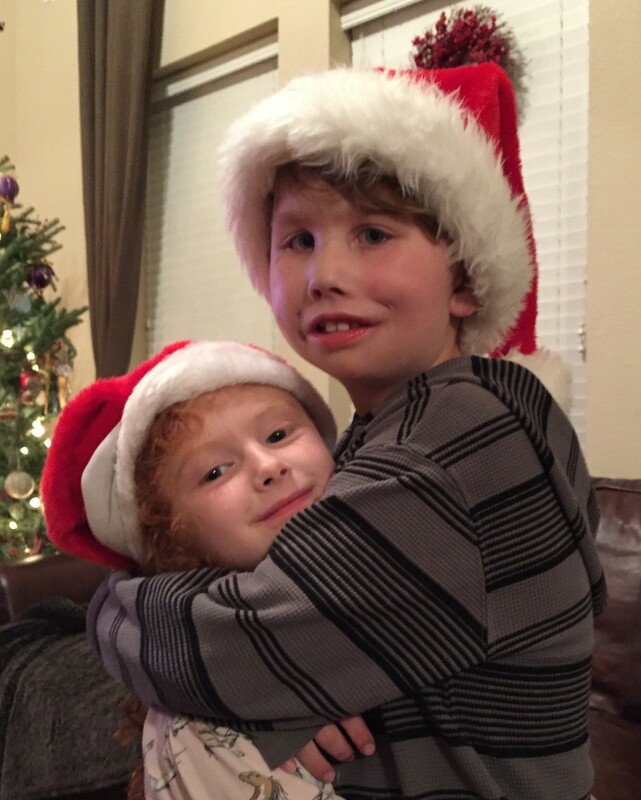 This picture of Jake with his sister Madi was taken 2 weeks after surgery .. he is still recovering but you can tell his smile is developing ..
Do you make New Years Resolutions? I no longer make them, however, I do set goals to better my life. One of my new goals for 2015 is to participate in B’sue Build a Line Design Challenge. I have everything ready to go and I hope you will follow me thru my journey. All of my components for this challenge were purchased from B’sue Boutiques .. If you want a great place to shop please visit: http://www.bsueboutiques.com/. Did you know you can win great gifts when you purchase from B’sue .. I’m still doing the happy dance on what I won yesterday. 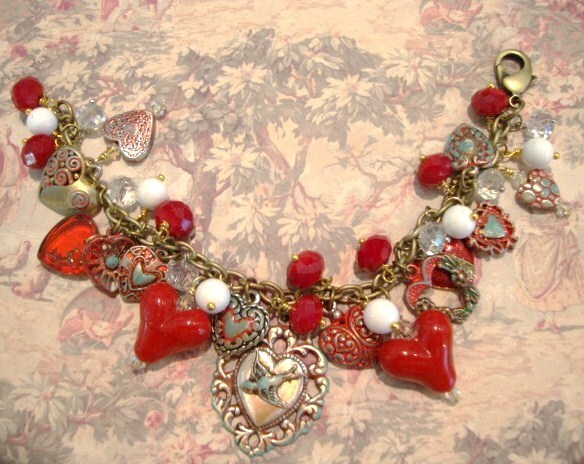 Look at all of those hearts, for sure I will be making Valentine Jewelry. Here are a few recent pieces I made in December .. I’ll be sharing much more as my new jewelry line develops .. The reason for this BLOG is to announce a new Challenge that I will be participating in. Brenda Sue Lansdowne of B’sue Boutiques is hosting this Challenge which starts in January 2015. Each participant is challenged to design their own jewelry line. If you follow me on FaceBook or on Pinterest you know that I jump all over the place. This will be fun .. so be on the look out for a new line from Clever Designs. At the bottom right side of this BLOG you will see a new BADGE which was designed by one of the members of the B’sue Group. It will be featured on BLOGS across the www as people are gearing up to participate. Please take a look at it and if your interested in joining a great group please visit B’sue Boutiques Creative Group on FaceBook. 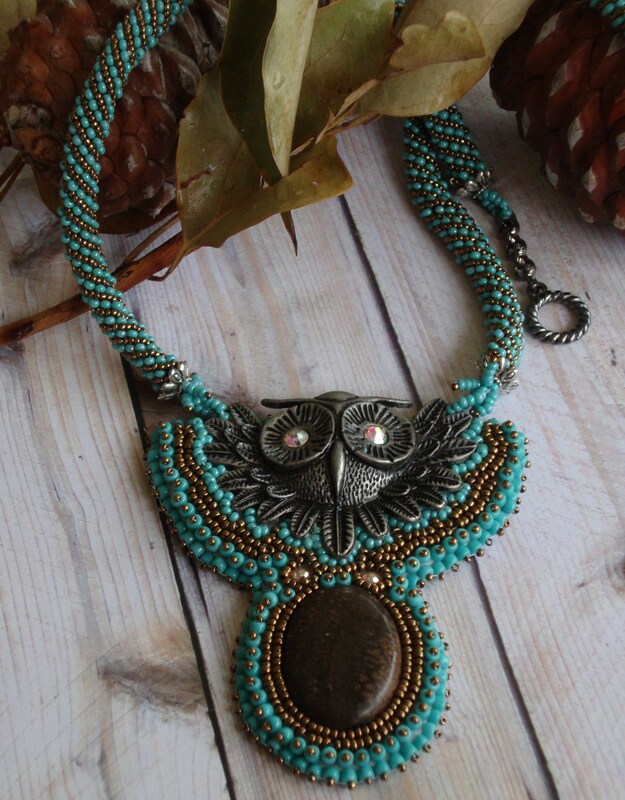 The necklace below is one of my new finished pieces and you can find it on my FaceBook page .. https://www.facebook.com/JewelsByJann or on Pinterest http://www.pinterest.com/janntague/clever-designs/ . Hope y’all enjoyed my second BLOG .. what an adventure ! Hi Everyone, this is my very first BLOG so please bear with me .. I want to tell you how I started my journey in Jewelry Design. In 2006 my husband was undergoing Cancer treatments and I needed to get out of the house (for my sanity) so I went to a craft show. I was walking around and I heard someone call my name. I looked to see who it was and it was a high school friend I hadn’t seen in over 25 years. She invited me to her home the following week to introduce me to jewelry making. I was hooked right away. Every Tuesday I would meet with a group of ladies and we would challenge each other to create a beading design of our choice. A new beading store opened near my home and I started taking classes to learn different techniques and that when I was introduced to mixed media by the owner. She introduced me to the B’sue Group, and that was about 2 years ago. My style has changed so much since joining B’sue Boutiques Creative Group on FaceBook. I have learned how to color metal, how to use stampings in my jewelry designs, learned assemblage, made so many new friends, and I was challenged to step out of my comfort zone to make beautiful new styles of jewelry. 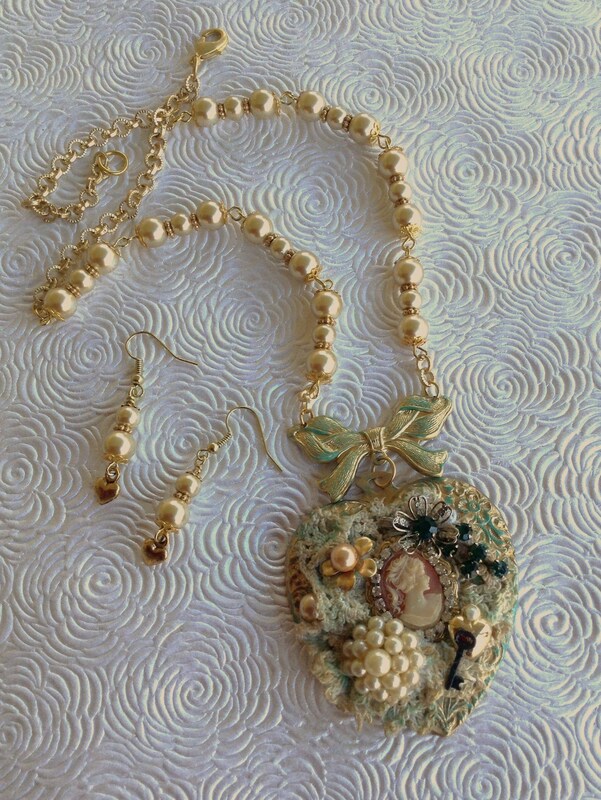 I have learned how to incorporate my love of beading with the mixed media style. I invite you to like my BLOG and to follow me on MY JOURNEY. Thanks for taking a look and come see me again.